Left, the medieval churches of St. Francis and St. Mary. During our visit we wondered around the old quarter looking at the various buildings and spotted two churches in close proximity to one another. 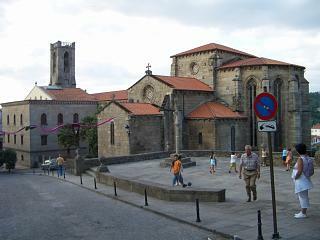 These are the Iglesia de San Francisco and the Iglesia de Santa Maria do Azogue and they lie just below the peak of the hill into which Betanzos is built. 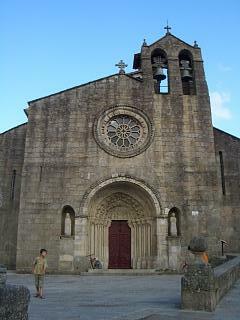 The later has a stone cruceiro in front of it and both are excellent examples of Galician architecture. At what seems like the highest point of the town there sits another church, the Iglesia de Santiago and this has a small square in front of it. Also in this vicinity are two other buildings of note, the pazo de Bendana, a manor house with traditional design features of the region, and the casa Consistorial. 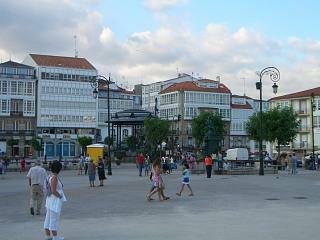 Leaving this area and walking downwards takes you to Betanzos's main town square. This is a large open plaza and the dominant building in it is the Iglesia de Santo Domingo. Also located around this plaza are the Hospital of San Antonio, the Colexio das Orfas, the Edificio Arquivo and of course the tourist offices. Other than the church, no single building dominates this square and it is the view, looking from the square and back into the old town, that is perhaps the most appealing. This area is also populated by sit-out bars and one of the narrow streets running from it seemed to be the tapas capital of the area with numerous rustic eateries offering a variety of regional raciones. By 9.00pm in the evening this area was very busy and we felt fortunate that we decided to call in for something to eat before the rush started. By the time we left most tapas bars had people lined up and queuing for a table. Because of our late arrival and the diminishing light, we were unable to fully explore Betanzos. In particular we did not wonder around the river side area or look at the many barges that were moored up - and for which the town is famous. I suspect that this was our loss and that time wasted exploring the bland and uninteresting city of Ferrol (which we would not recommend) could have been far better employed in Betanzos. I you are staying in or close to the cities of la Coruna, Santiago de Compostela or Ferrol, then Betanzos will give you the taste of a real Galician town. 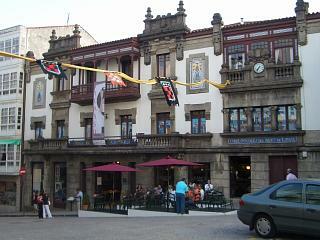 There is plenty to see and the town's old quarter is certainly one of the best in la Coruna province. The towns location on a river, along with its encompassing Roman wall and numerous churches, all add to the overall appeal and we wished that we had the luxury of more time to spend there.